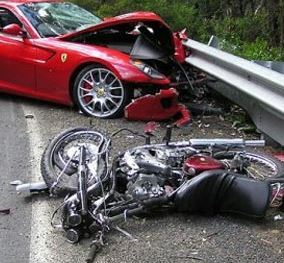 Your accident dream is not necessarily a premonition of the future so do not jump to conclusions. Are you driving yourself too hard? Perhaps you should slow your life down a bit. If your life feels like it is set on a course for disaster, examine your mistakes and resolve to set a new and better course. If the accident happens to someone else in your dream then examine your heart for you may have suppressed hostility towards that person. Unexpressed jealousy resentment or hatred may be finding its release through your dream. Perhaps also the dream refers to accidents of a different kind such as accidentally saying the wrong thing or accidentally forgetting your anniversary. 1. Do I feel emotionally at peace with myself? Probably not but use the dream as a prelude to a more peaceful you. Get yourself in balance. Relax, listen to music, and take up yoga, meditation or some therapeutic activity. And stop punishing yourself! 2. Have I had similar dreams before? If yes, try to recall your emotional state at the time. Remember the lessons you learnt from the past and apply them again to today’s circumstances. The augury says to take care for 24 hours following the dream. Some dream traditions believe that accidents at sea pertain to love affairs but accidents on land symbolize business problems. A car accident dream may represent the fact that you are driving yourself too hard. If a family member or someone emotionally important to you is injured in an accident this may represent a part of your own emotional make up that feels hurt. It may also represent your own feelings towards that person. To dream of a train wreck suggests that your plans have gone wrong. Emotionally you have ‘gone off the rails’. A ship wreck or accident at sea also symbolizes plans going wrong but the water element in the dream may suggest that these are emotional plans such as a relationship problem. To be overwhelmed by water is to be overwhelmed by emotions. Dreams about accidents in the home may reveal that tension is building in your home life. Accidents such as breaking things may show a new direction – a break with the past. It can also show your disappointment about something in your life that has been destroyed. Slipping up may be a dream pun that shows that in real life you have made a mistake – a ‘slip up. I am sitting downstairs on a brand new red bus. I am the only occupant. The bus is completely bare of any route information, posters nothing at all and is very brightly lit with a white light. The bus is running parallel with a small pavement against a high brick wall. Suddenly, another identical bus draws directly alongside my bus and then overturns with an enormous crashing sound onto my bus completely crushing it with me inside. The noise of the crash is enormous but stops abruptly and there is a silence which I cannot remember having ever heard before. I am wedged in between both sides of the crushed bus and cannot move except to wiggle my toes and although the back of my head is wedged the side of my face, my right hand cheek is about one inch away from the wreck. The bright light is still on and I am not hurt but suddenly I realize with absolute terror what has happened, where I am and the consequences and I cry out ” but God, they will never find me” – AND THEN I WOKE UP! I had this dream about six weeks ago and it has disturbed me deeply and I find it difficult to get out of my mind. Your interpretation would be appreciated. CRAIG’S INTERPRETATION: This dream is about your feeling that life is out of control. Vehicles represent our direction in life and, as the bus is public transport and not something you drive yourself, it can symbolize a situation in real life that you feel is outside of your control. The bus is new which may represent a new venture, fear about illness or even a new emotional situation such as a relationship. You are the only occupant. This reveals that you feel alone and the lack of a route information shows that you lack a sense of direction. Then life hits a brick wall and another bus crashes into you. This represents how your feel: you are going through an emotional crisis – a crash. I would expect that whatever it is that is troubling you has caught you by surprise. What worries you the most is that you feel emotionally trapped and crushed by these overwhelming feelings. You can hardly move at all – even wiggling your toes is difficult and one of the most sensitive parts of your body – your cheeks – feel vulnerable and exposed to potential pain. Right from the start of the dream you have been aware of a light in the bus. Light is a symbol for our spirit, for hope and in this case also may represent your connection with God. The last part of your dream is a cry for help. Dreams are part of an emotional healing process and this one reveals a need to share your worries with others. You feel dejected and alone. The dream is telling you that the solution is to share your feelings. A trouble shared is a trouble halved. I had a dream last night that my partner and I were travelling at the front of a double-decker bus (although we seemed to be at the bottom but driver never existed) and it was driving pretty quick past other parked buses which were on our left, when one pulled out, facing us, to drive over to the other side of the road, pulled out at such speed we had a head on smash and we both died. I even remember a big silver wheel at the front of the opposing bus. Everything went black except seeing my partner & I and I have vivid thoughts saying to myself that it didn’t hurt, dying this quick didn’t hurt, then I thought so deeply and it was black for so long that I knew I was dreaming and woke myself up . Can you interpret this for me? This dream is about your relationship. You are feeling that things may be moving too fast and out of your control. You feel the relationship could crash. It will probably all be fine but perhaps you both need to take your feet of the accelerator and let things happen between you naturally.